Anne Scott was a kind and generous woman who regularly made and gave away organic blackcurrant jam, birthday and wedding cakes, quilts for babies and brought home-made apple cake to lighten committee meetings. She also used her considerable domestic skills to make things for fundraising for WILPF. Looking back on the ten years that I have known Anne, I have no idea how she managed to find time to make all these gifts without ever appearing rushed. Because however much time was used to produce all these goodies, she always had time to attend meetings to support and organise campaigns for peace and justice. 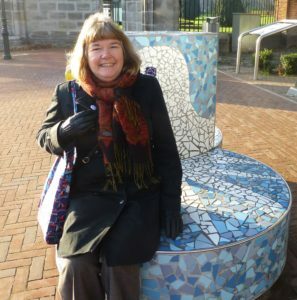 Anne was an outstanding campaigner, always coming up with ideas on how to communicate with others but equally she was not afraid of the hard work of maintaining WILPF infrastructure, acting as minute secretary for many years for both the Scottish branch and for the WILPF UK section. She often helped behind the scenes to organise demonstrations, events and seminars. Even in her last weeks she was making lists and organising what should happen after her death. Her commitment to WILPF was solid – she was the one who always wore her WILPF t-shirt to events and demonstrations and remembered to bring the WILPF banner. She had long been a street activist for issues of peace and justice when she brought her knowledge and skills to WILPF. In Scotland she represented WILPF at the many peace campaigning meetings, regularly travelling to other towns by public transport. She offered support to others and was ready to give praise and encouragement to other campaigners. Modest about her own achievements, she had begun to be more confident about speaking in public, speaking with passion and without notes. Travelling to meetings, Anne was always a cheerful and sympathetic companion. In December 2013 the Scottish branch felt unsure about preparations for WILPF Centenary Congress which was to take place in 2015. Having decided to travel to Holland to get a feel for the historic site and find our way around The Hague, we spent five most enjoyable days in the Netherlands talking with our Dutch colleagues who arranged for us to have a tour of the Peace Palace. We came back to Scotland full of enthusiasm and Anne was ready to prepare WILPF UK for Congress 2015. Anne’s life was cut short on Sunday 29 July by an aggressive cancer. She will be mourned by her husband Archie, her daughter Rosa and her many friends and fellow campaigners in Scotland and in WILPF. In Scotland and UK, the WILPF committees will all miss her enthusiasm, determination, hard work and her cakes. Her contribution to Women’s International League for Peace and Freedom inspired us all: she will be missed. Anne was an active and hard-working member of Edinburgh CND, Edinburgh Stop the War and Abortion Rights Edinburgh, as well as Scottish wilpf. Anne was an inspiration for many of us at WILPF. Even during her last days, she was working and keeping her peace activism alive. She contacted us at WILPF Colombia (LIMPAL) to contribute to the 2018 Edinburgh World Justice Festival with a short piece about Abortion Rights in Colombia. So this article is in her honour. Anne will be greatly missed. From many of us at WILPF Colombia (LIMPAL), we send her family/relatives and other UK and Sottish WILPF members our love and solidarity.